A huge thank you to Stowe Mountain Lodge for hosting us during our stay. 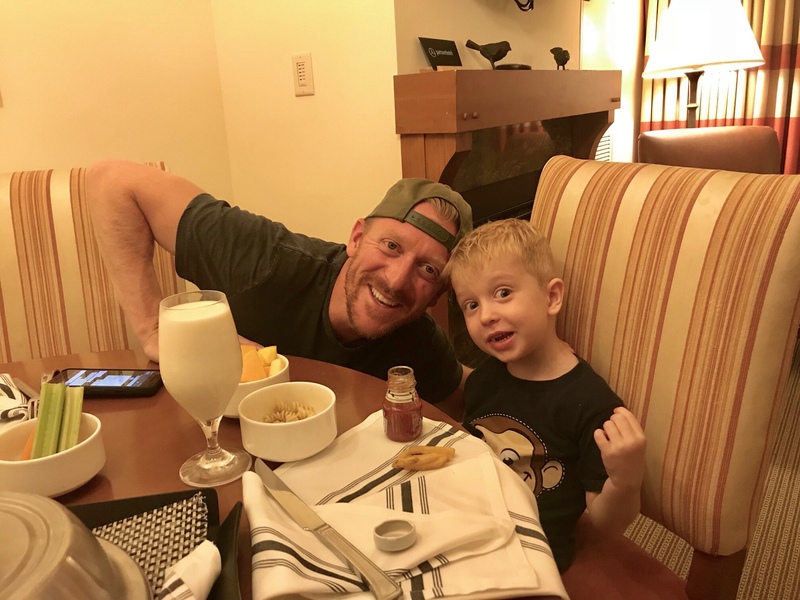 We had an absolutely amazing time, and we can’t recommend this resort enough as a family vacation destination! Oh, boy, I don’t even know where to start with this recap. 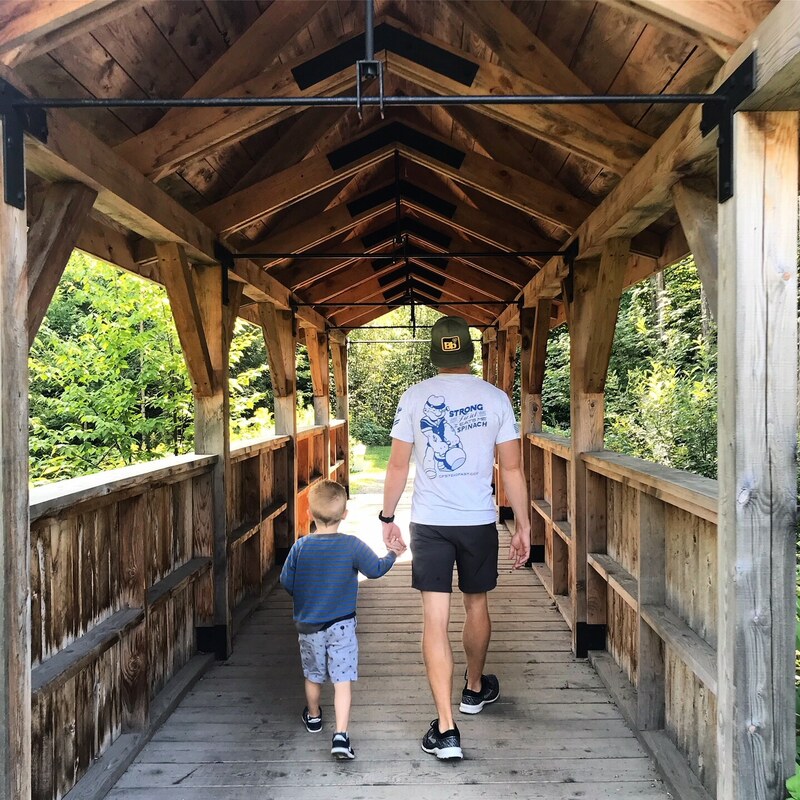 I almost made a video recap because I just have SO MUCH to say about our recent stay at Stowe Mountain Lodge, but, hopefully, I can share all of the awesome details in this blog post. 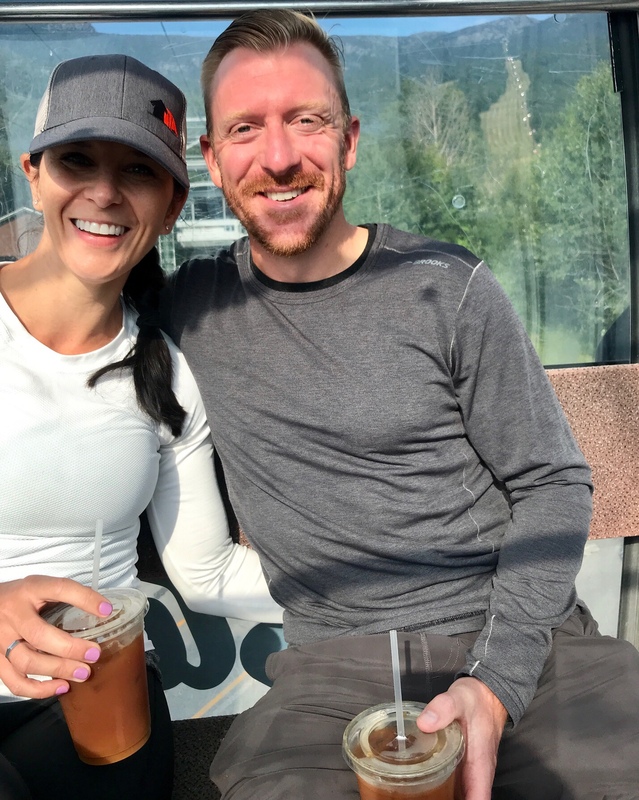 We really had such a wonderful time, and we haven’t stopped raving about Stowe Mountain Lodge since we got home – to each other, friends, family… basically, anyone who will listen! We already loved the resort after visiting last year, but now we love it even more. 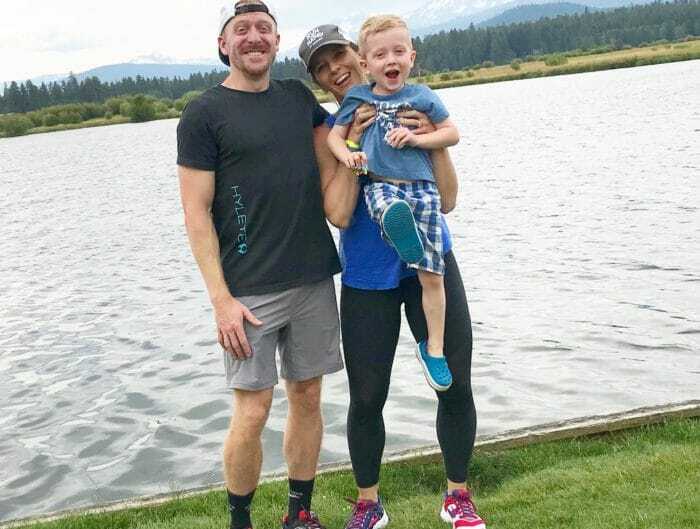 It’s such a great place, and we’ve made so many wonderful family memories there, including a number of “firsts” for Quinn. 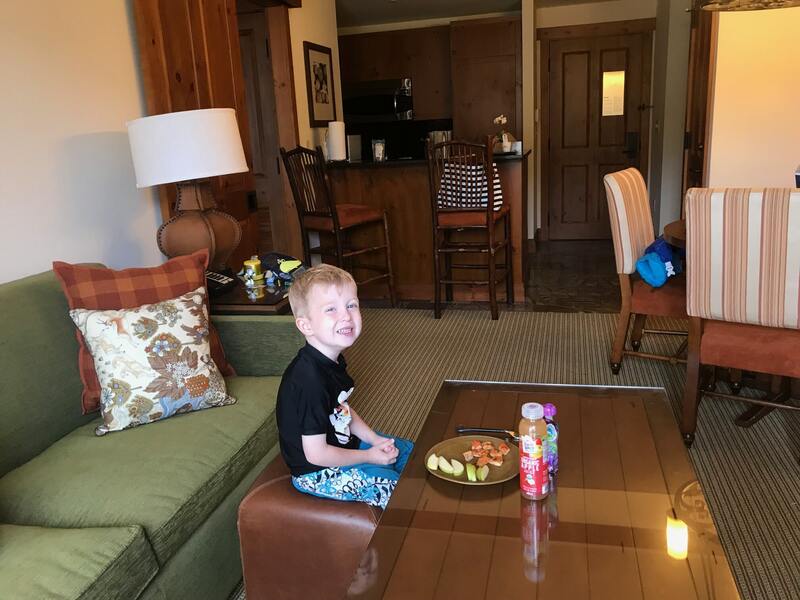 I highly recommend Stowe Mountain Lodge as a place to vacation (year-round) with your family! Without further ado, let’s get right to our recap – with young children in mind. 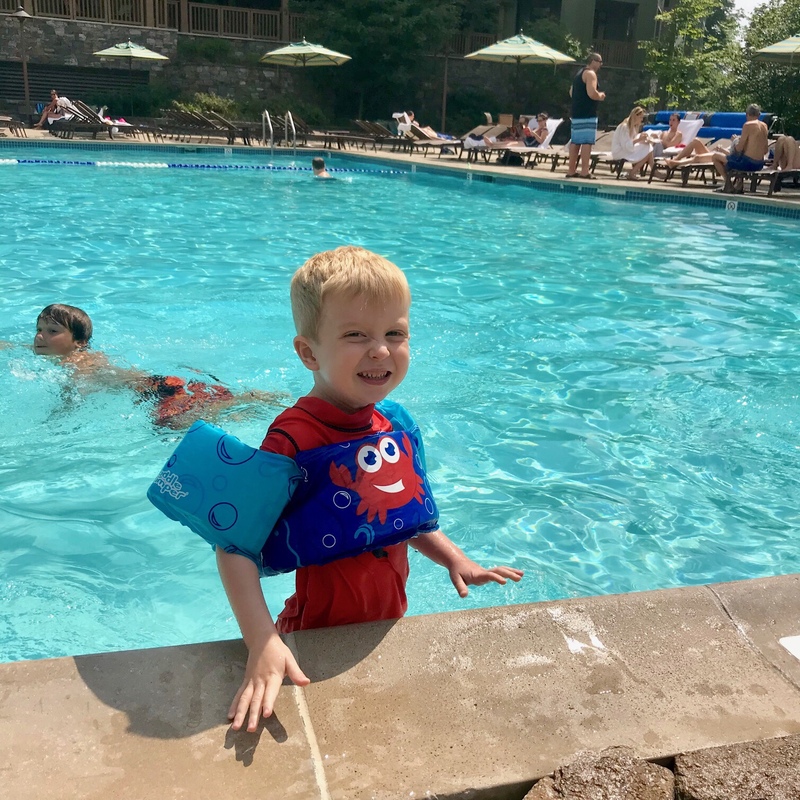 The parents out there know that a “vacation” with small kids is typically just a “trip” because it’s typically not all that relaxing, but Stowe Mountain Lodge really makes it easy to enjoy your time with little ones. I swear! 🙂 Ok, here we go! Quin was obsessed with the pool, so we spent a good amount of time there during our stay. The pool is heated year-round to 84 degrees F, so even on the cooler days, it still felt nice. I’m generally not a huge fan of water (too cold), but even I thought the pool was warm! 🙂 There’s even a section of the pool that has indoor access, so you can ease in and make your way outside in the colder months. The pool area also has two large hot tubs where kids were allow to play. Typically, resorts don’t allow kids in the hot tubs, so this was a nice surprise. Quinn loved the hot tub and even told us he was on “Team Hot.” Haha! 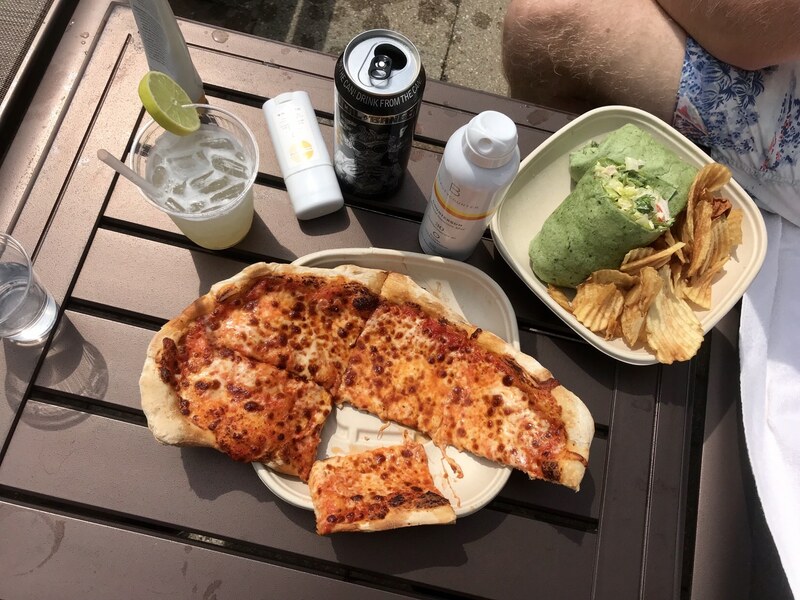 The Aqua Pool Bar offered a variety of food and beverages. It was super convenient – located poolside – so it was easy to spend a good potion of the day there. 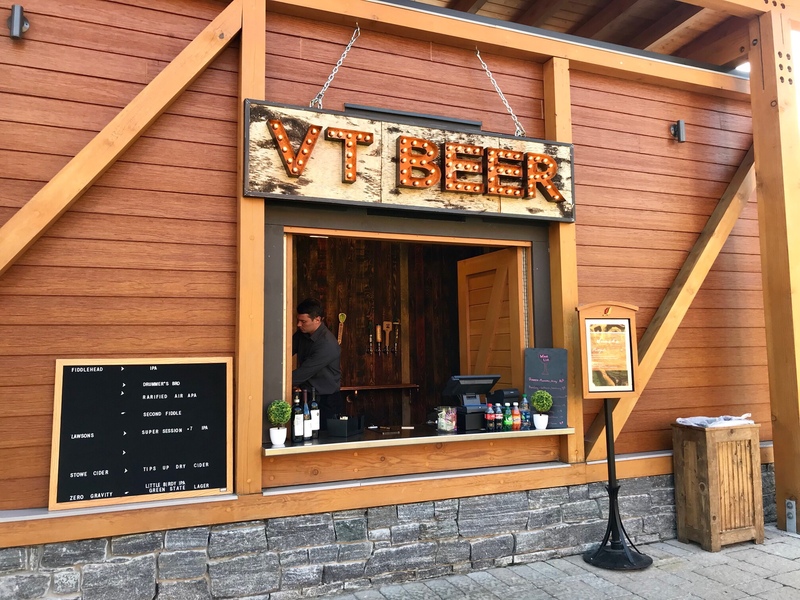 From hot dogs, pizza, and wraps to all sorts of interesting drink options – including lots of local craft beers and fancy handcrafted cocktails – there was something for everyone. We were definitely happy with the selection! Quinn also (really) loved the map that he received at the top and used it to “guide” us around the hiking trails at the top. The hiking trails were mostly just dirt roads and paths, so it was perfect for a young kid. The Enchanted Forest and playground were a lot of fun for us. 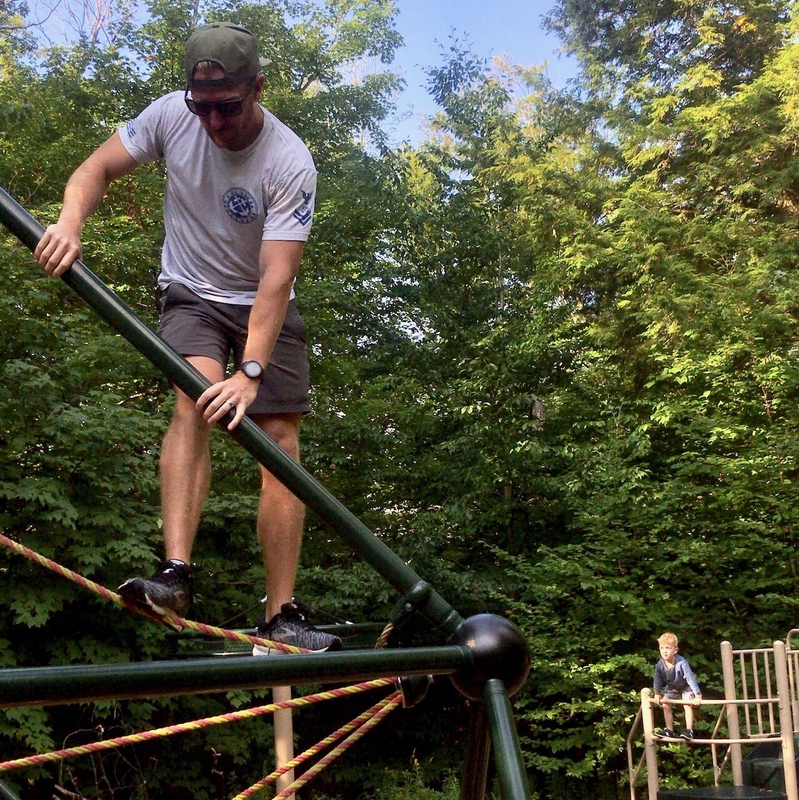 There’s even a low ropes course that Quinn was able to complete with a little help from us. It’d probably be better for a bigger kid, but totally do-able for a younger one with adult assistance. 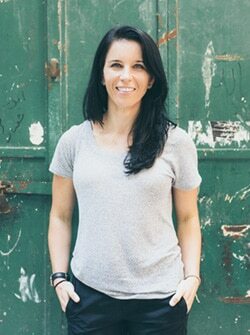 The playground itself was perfect for younger (and older) kids – it had swings, slides, and even a small rock wall. We spent a solid hour playing around on everything! We also brought a few items from home that we knew Quinn would eat and took advantage of the full kitchen. 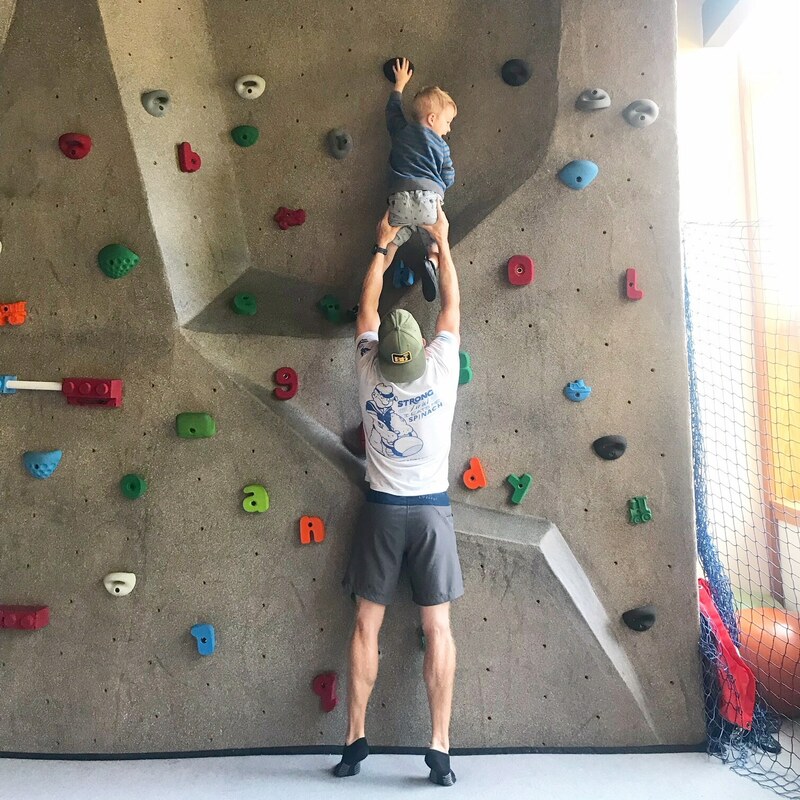 The Adventure Center at Stowe Mountain Lodge has a ton of fun indoor activities for both kids and adults, including rock climbing. 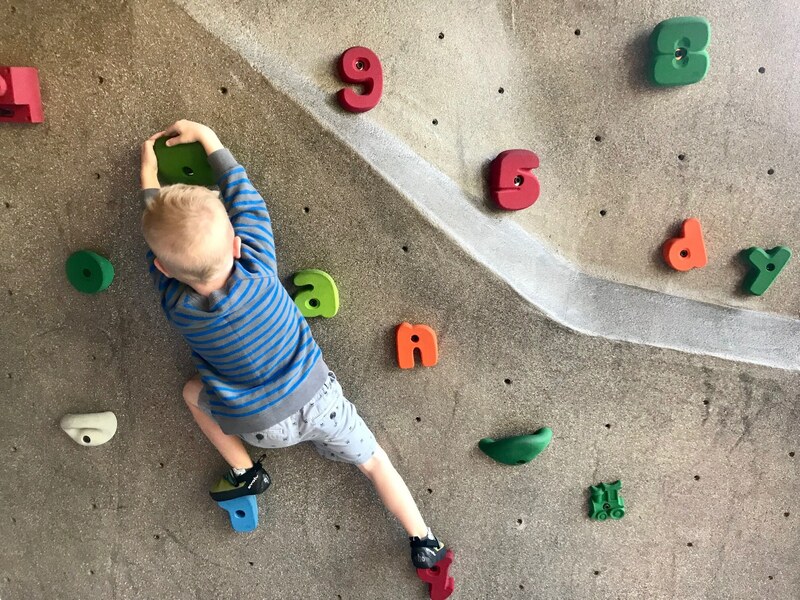 There was a separate climbing wall with a belay system, but, right next to it, was a smaller one perfect for younger kids. 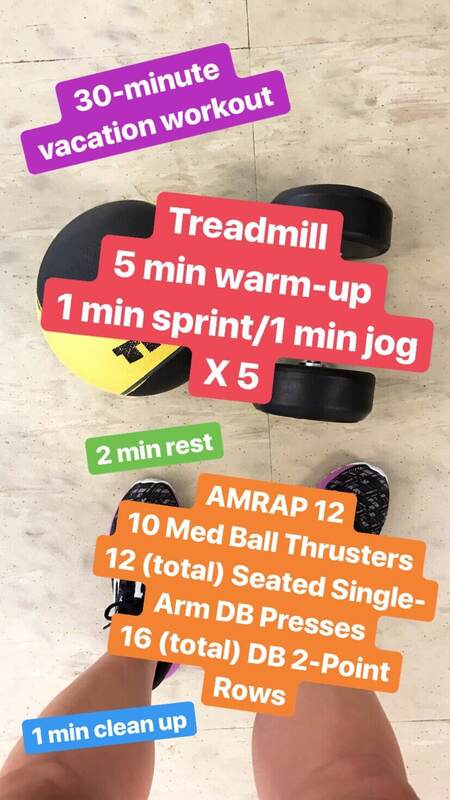 The fitness center was well-equipped with tons of cardio machines (treadmills, spin bikes, ellipticals), free weights (dumbbells + barbell), medicine balls, and more. It’s definitely a legit gym – big and open with lots of new equipment overlooking the pool. 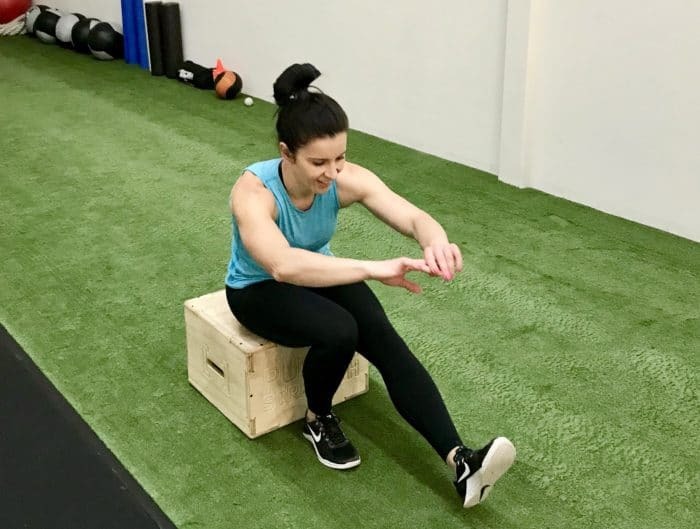 There are even group exercise classes that you can take. Mal and I both took turns doing quickie workouts while the other person was on pool duty with Quinn. 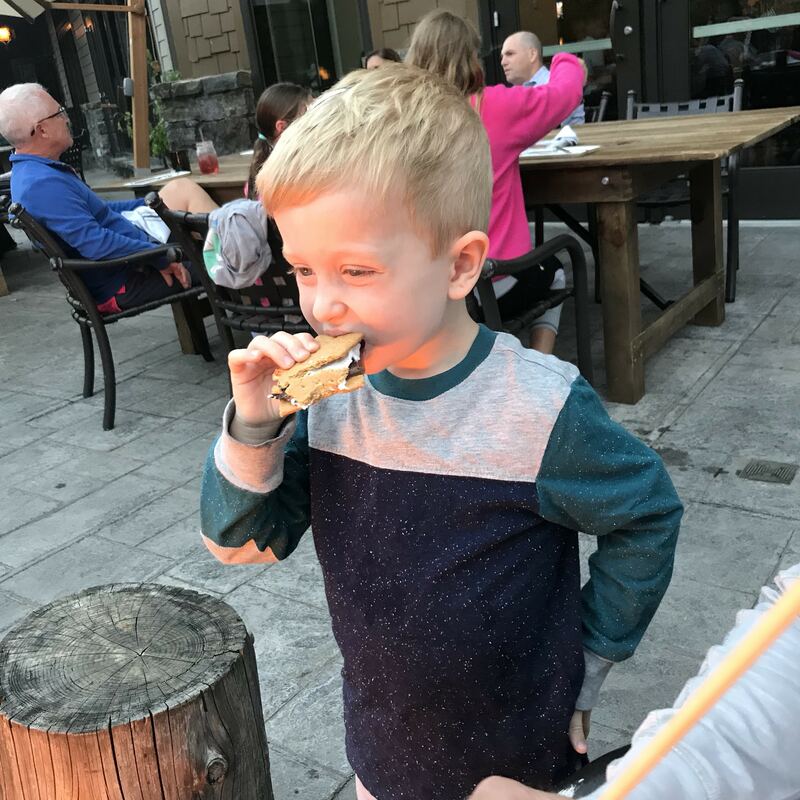 We lovvvvved the dining options at Stowe Mountain Lodge last summer, and they got even better this year. 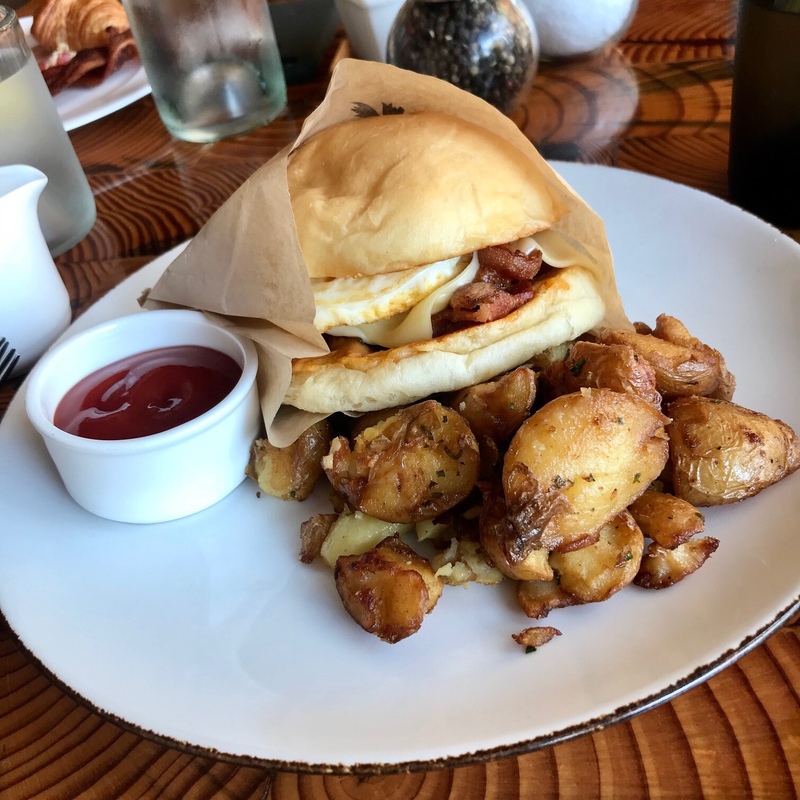 All of on-site restaurants are fairly casual and kid-friendly, but definitely upscale with regard to the menus. All of the ingredients are local, fresh and, in many cases, organic. 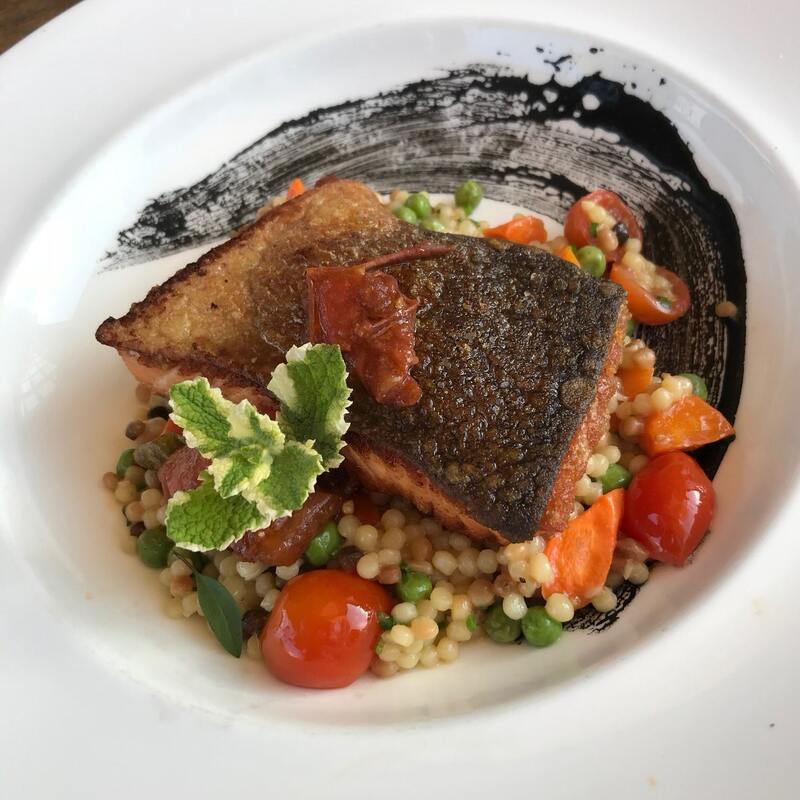 The selection was truly delicious and the menu changes frequently with each season, so there’s always something new and exciting to try. Kids under 5 eat free (!! ), and there’s a kid-friendly buffet on Friday and Saturday nights with all sorts of kid favorites (pizza, pasta, grilled cheese). 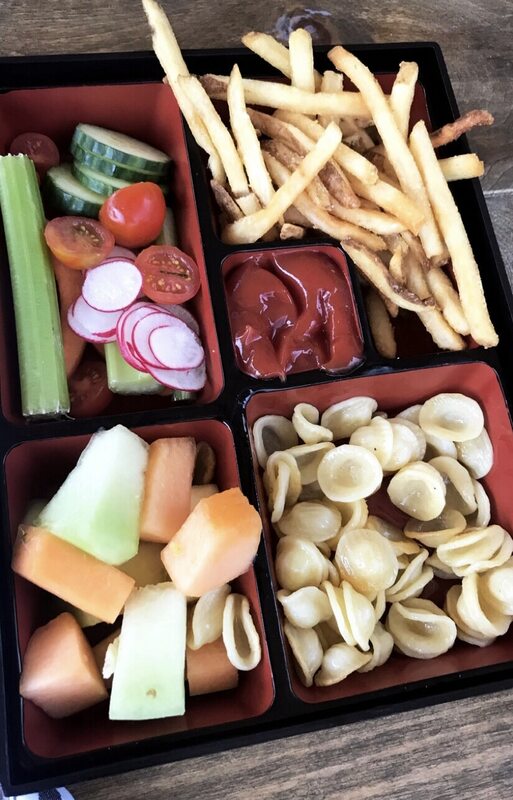 We were also pleasantly surprised when we ordered the “white pasta” (on Sunday night when the buffet wasn’t available), and it was served with French fries, veggies, and fruit. 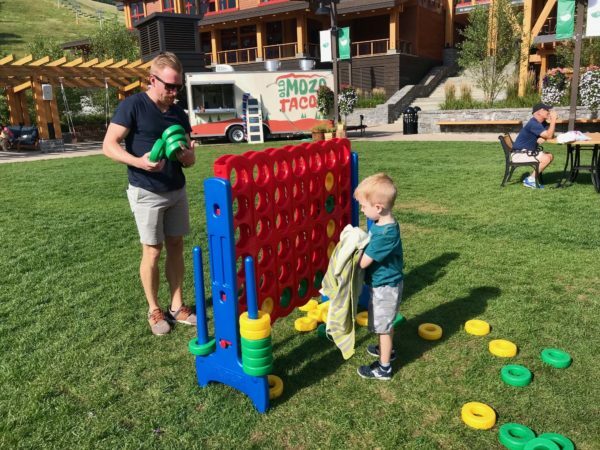 The outdoor space at Stowe Mountain Lodge is so great – there was all sorts of yard games, live music, outdoor bar, taco truck, and more! We had a great time hanging out on the lawn and even made some friends – furry ones too! 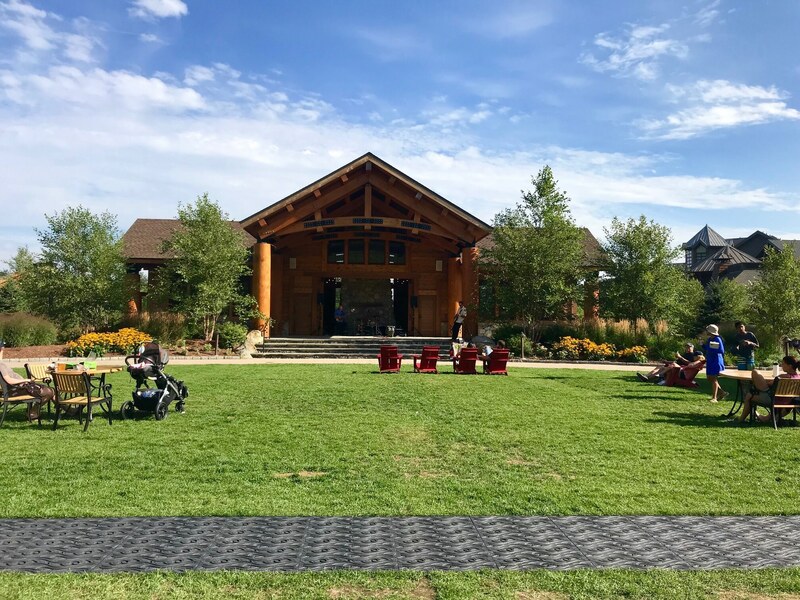 🙂 FYI: Stowe Mountain Lodge is dog-friendly! In the winter, the space actually turns into an ice skating rink. How cool is that? 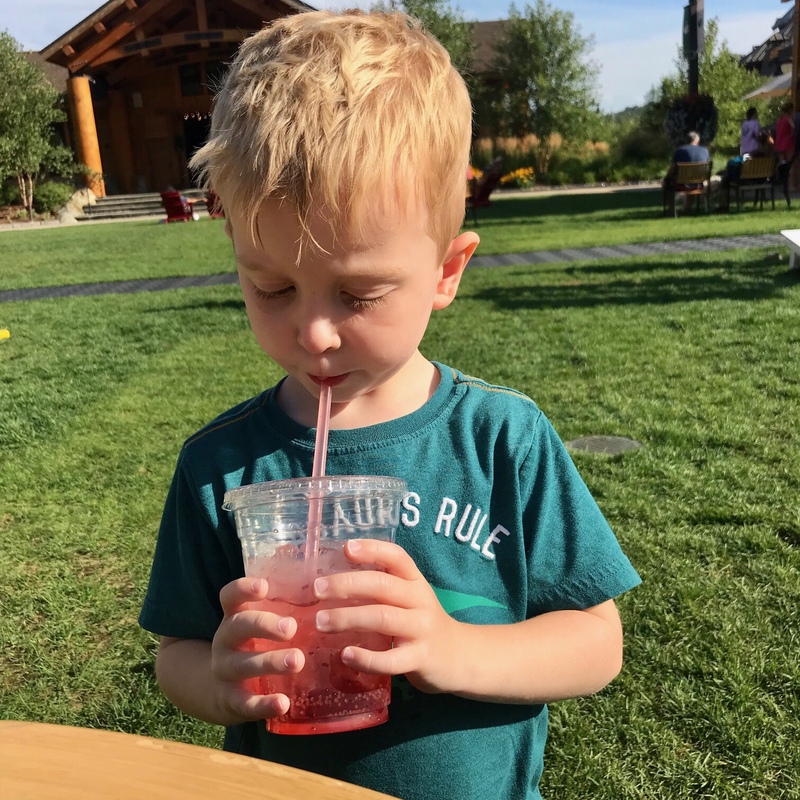 Another first for Quinn was drinking his very first Shirley Temple, which he absolutely loved – he sucked it right down! 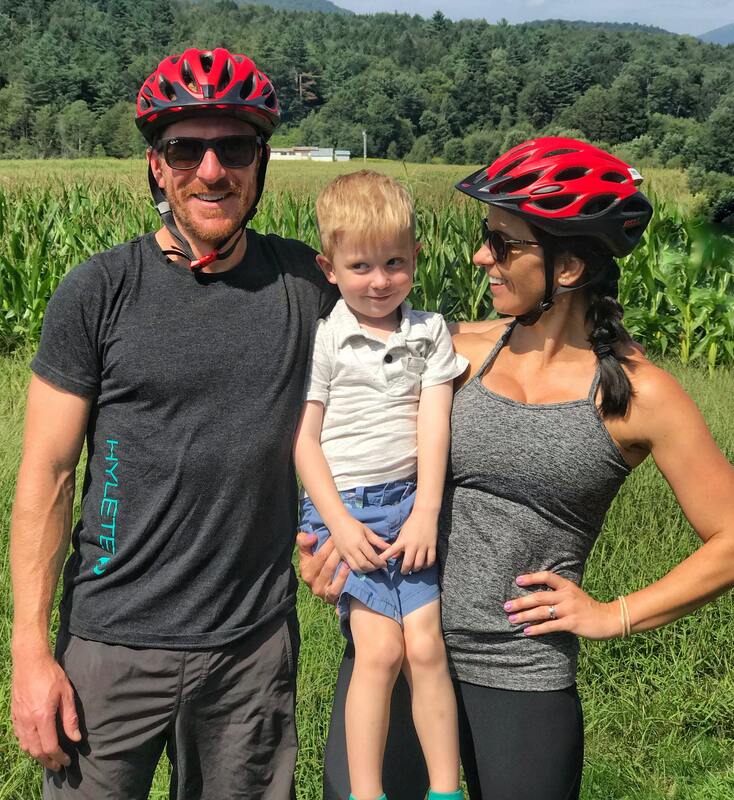 There’s a great bike path that runs through Stowe, so we were all about having a family bike adventure. We rented bikes at Pinnacle Ski & Sport, which was a quick 4-minute drive down the road from Stowe Mountain Lodge. 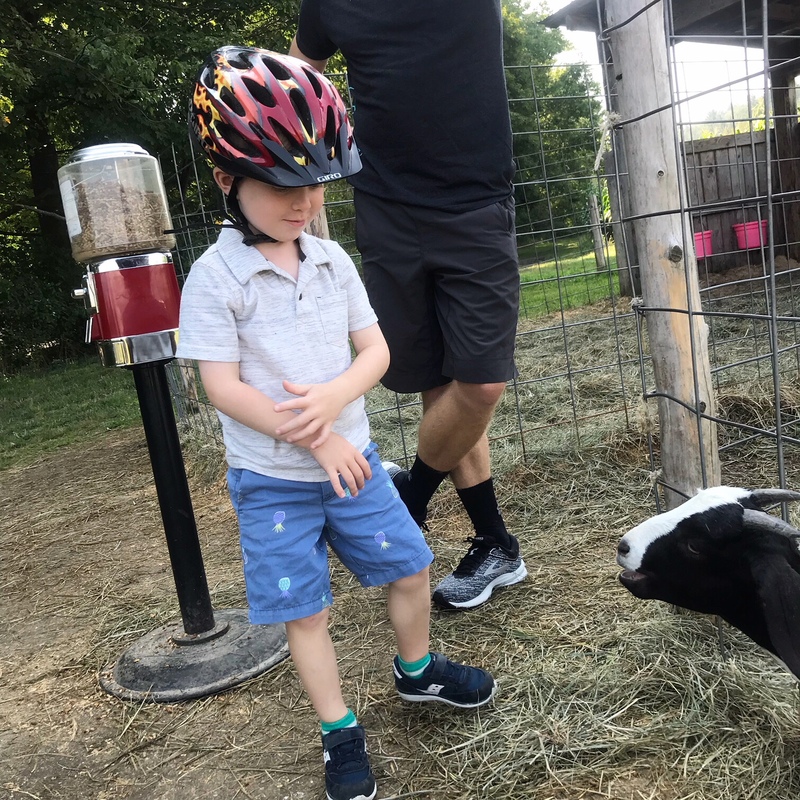 We spent a couple of hours biking around and even stumbled upon a petting farm and corn maze! 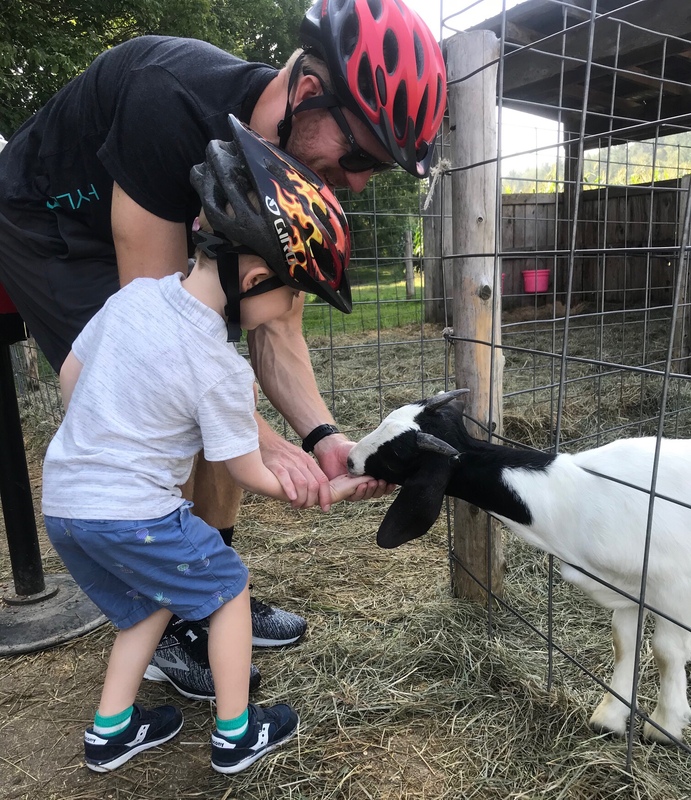 All in all, we had an incredible visit to Stowe Mountain Lodge, and I hope you enjoyed reading our recap, especially if you have young kids and are thinking about a getaway. We really, truly love this resort and would 1,000% visit again even if it wasn’t sponsored. There’s so much to do and, even after two visits, I still feel like we haven’t experienced it all. I mean, we haven’t even visited in the winter yet, and I know there’s a ton to do then. Maybe this year will be the year we finally get Quinn on skis! Parents with kids who ski: How old were they when they first started? P.S. 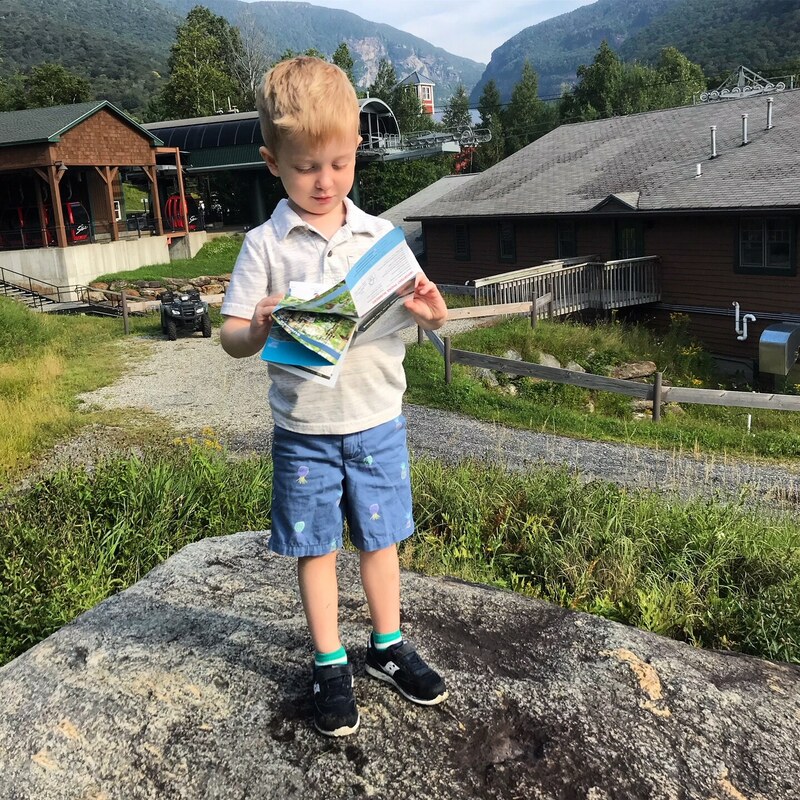 Be sure to check out my first review of Stowe Mountain Lodge, including our zip line adventure, kids’ camp (childcare), spa, coffee shop, arcade, and more! My husband took our kids daughter age 7 and twin boys age 5. They did a lesson or two and then. He had them on his own. Was crazy but. Now they are 20 and23 and love skiing. 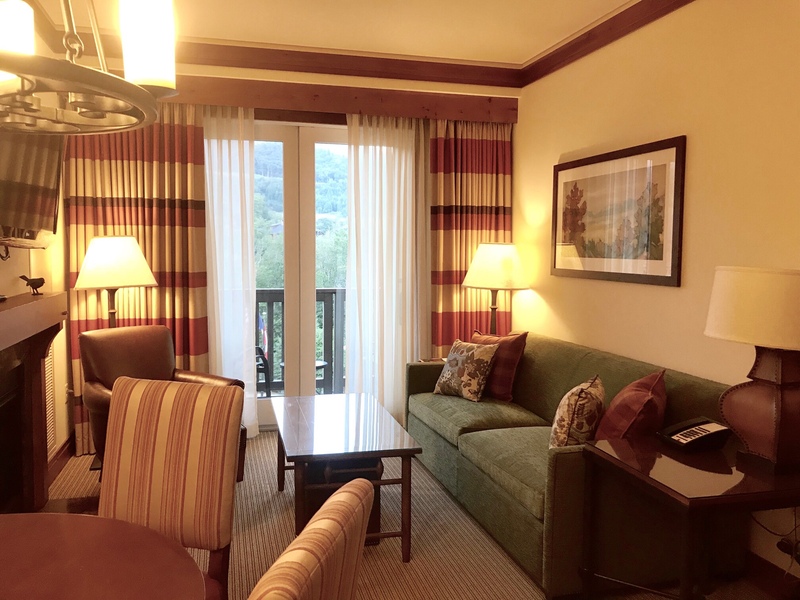 I have been to Stowe Mountain Lodge and love everything about it! However, I do have concerns about the cleanliness of those hot tubs if young children are sharing in the experience, Especially if the children are still in diapers or pullups. Yuk. I’d love to know the prices. 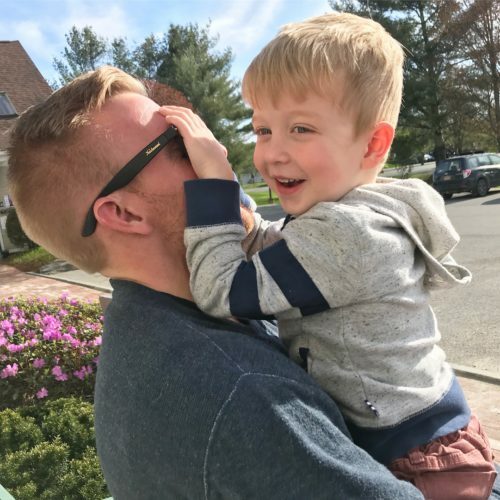 My husband grew up in Stowe and NOTHING is affordable for families with children nowadays. It looks awesome, but , price is a huge factor for families and my guess is many would not be able to afford a weekend like this. I know you get it free as a blogger, but, I wish it could be included in your blog somehow. That will really be the deciding factor if people will go or not. Just my two cents because I know Stowe is notoriously expensive. @karen: I thought the same thing… this trip looks amazing… but when I looked on their website.. prices for a 1 bedroom suite started at $470! Too expensive for a family with young kids. I hear ya. Stowe is expensive. All of the pricing for SML is on the website, and it varies depending on when you go (day, time of year). The great thing about SML is that they offer deals all the time (check their promo page!) and kids under 5 eat free. The rooms have full kitchens, so you can always bring food and prepare it there. 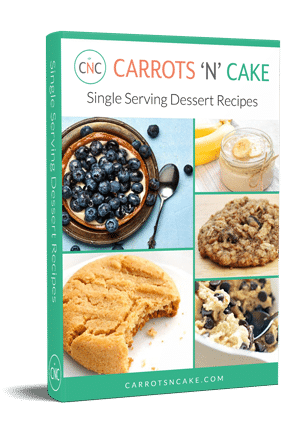 We did that for a few meals, and it worked out great! Thanks so much for the review! 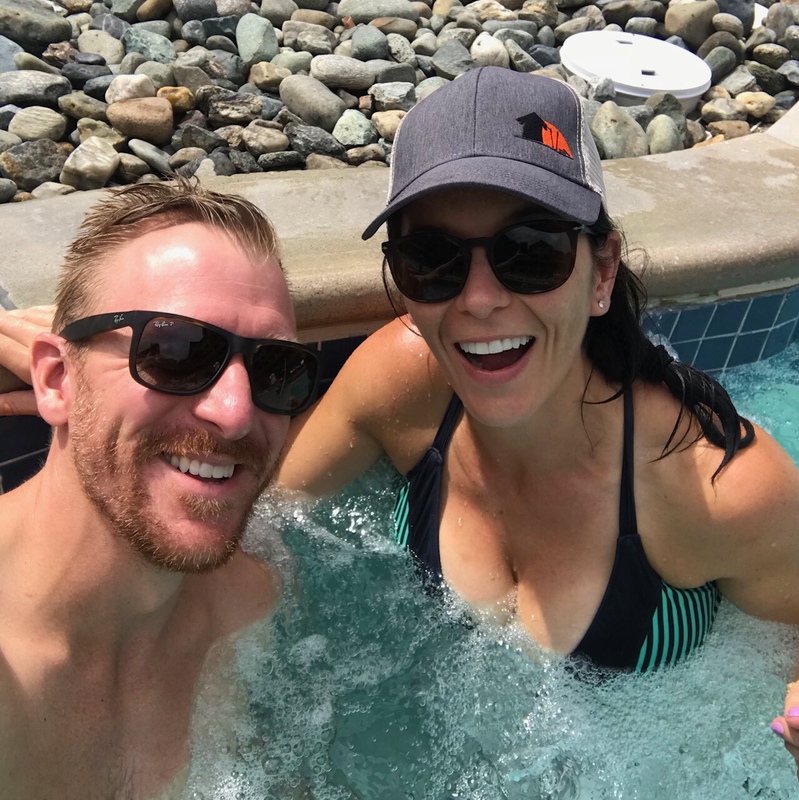 Were there any adult only hot-tubs? Do you think a couple would find this resort TOO family oriented?